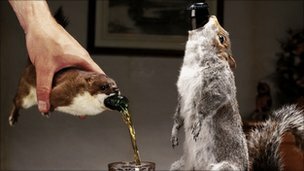 Animals and alcohol have always had a strange relationship and we have rounded up the top 10 animal and alcohol stories out there. There are stories of animals becoming drunk because of alcohol, some animals enjoying a glass of wine or others being given wine to ward off the flu. A classic animal alcohol story was reported by the BBC after a drunken elk got stuck in an apple tree. Emergency services, helped free the boozed-up beast by sawing off branches. The next day the animal took itself off into the woods with a hangover.